I have just returned from a long weekend in Amsterdam and Utrecht where I visisted three churches. In the first one I said a prayer of exorcism. There had been problems there (big problems!). I met two young priests who were looking after the church. They had taken over, at the request of the bishop, following some very strange happenings. The church is huge and cold. The house is also huge and in a very bad condition. Please pray for these priests and for those who still worship at that church. I celebrated Mass, preached, gave a talk and prayed for the sick at two other churches. Both of them big - one massive. In both places over one hundred people came. In the second church, the "English" Catholic church of Amsterdam, The Holy Trinity, there must have been well over 200 people, possibly 250. This visit was arranged under the title of "True Life in God". Many of those who came already read the book or books and many know about Vassula. I have been twice before to Amsterdam, but my last visit was purely as an exorcist to help someone who could not find help nearby. This kind of thing is not unusual for me. I once went to Nice to help someone there and I have been elsewhere. Sometimes exorcists are hard to find, in spite of the Holy Father's wish that there be more of them and at least one in each diocese. The Catholic Church in the Netherlands seems to be in a sorry state. In one church I preached on confession and was told afterwards that some people have great difficulty finding a priest to hear their confessions. As in many places, there is a shortage of priests, and one of the churches I visited has no resident priest. There is talk of closing some churches or even demolishing them. 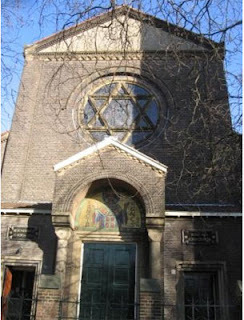 For all that, Amsterdam is an important Christian centre. It is a city associated with a Eucharistic miracle, and it is where Our Lady appeared as the "Lady of All Nations".